PHOENIX — I’ll probably always remember going up to Rob Gronkowski after Super Bowl LIII, when he was still in considerable pain, and the Patriots locker room was empty, and asking him if this one meant more because of all he’d gone through to play a ninth NFL season and, ultimately, get a third championship. I don’t know for sure, but my guess is that’s why we got the news of Gronkowski’s retirement on Sunday. He was uncertain about playing in 2018 in the first place, because of the toll the surgeries, and the hits and the concussions took on him. Then he went through with it, and I’d bet it was harder than he’d imagined it would be. Gronk couldn’t take over games like he had before. And his production showed it. So this was the right time for him to walk away. It sure seems now like that’s what he was saying to me back in that locker room in Atlanta. 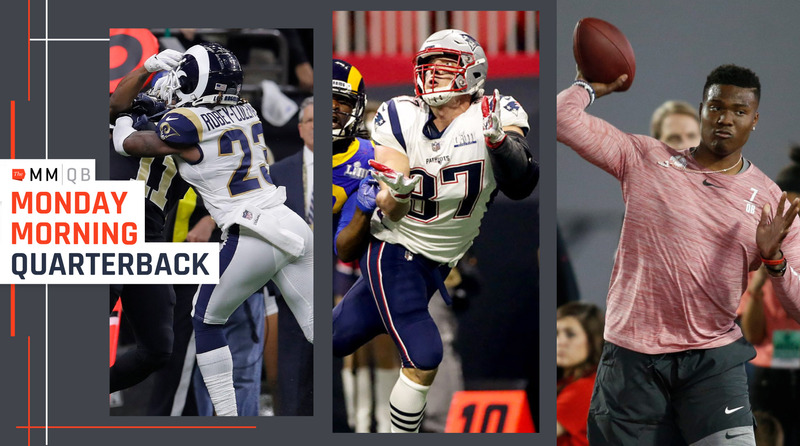 But no matter how this season ended—and it ended on the highest of highs, a Super Bowl championship in which he made arguably the biggest play—Gronkowski was going to be able to retire with an argument for being the greatest player ever at his position. What does his 2018 season add to that? It was an example, laid bare, of how Gronkowski was actually the antithesis of the big goofy airhead he was made out to be. His final season showed his grit (in fighting through injury), his football know-how (in being able to reinvent himself week-to-week), and his commitment to those around him (just watch how he blocked for the run when he couldn’t dominate in the pass game as he did before). Gronkowski will be in Canton. Whether he’s the best tight end ever is up for debate only because he didn’t have the longevity some others did. What’s not debatable is the legacy he leaves, one that few at his position will ever match. And we’ll explain why. • A deep dive into what’s on the agenda for this week, with competition committee chair Rich McKay’s perspective on all the proposals for rules changes. • A look at what Colin Kaepernick’s settlement with the NFL means, assuming the Wall Street Journal’s number is correct (Based on how/where it was reported it’s a lot less shaky than previous speculation out there on this). •Why if I were another team, the Colts signing Justin Houston would be a little bit of an “oh s---” moment for me. • I’m not big on the idea that guys “shoot up the draft board,” but I have a name for you in here of a player that’ll go much higher than I thought a month ago. • The Raiders are checking out quarterbacks. Would it make sense for them to move on one with the fourth overall pick? We’ll examine. And, of course, a lot more on both the draft and free-agency front. But we’re kicking off, of course, with Gronkowski. I was talking with someone who worked closely with Gronkowski over the last few years shortly after the announcement, and he told me that, in his opinion, the 6’6”, 268-pounder is the greatest pass-catching tight end of all-time and on the short list of greatest blocking tight ends ever. How crazy is that? To illustrate it, this coach said, “It’s like Magic Johnson having the ability to play center in the NBA Finals.” Except Gronkowski was showing that remarkable versatility regularly, in essence playing two positions at once at about as high a level as possible. He was the ultimate chess piece for Bill Belichick and company to move around the board. And as unique a weapon as you’d find in pro football. “I mean, in my opinion, he's the best combination of power, athletic ability, great hands and excellent instincts in the game, and it was right from the beginning when he came to New England,” said Texans coach Bill O’Brien, Gronkowski’s offensive coordinator for his first two years in the league. “There's obviously a learning process, but you could tell right away that this guy had a real idea of how to play football. And he had a great instincts, and then he had incredible skill. “I mean, he had great hands. I've been fortunate enough to coach DeAndre Hopkins, Randy Moss and Rob Gronkowski, and I would tell you those three guys, those are the three best pairs of hands I've ever seen. Rob could go down and catch balls off the top of his shoes, he could catch balls way over his head. And he had a really good idea of how to run routes. Part of it—the physical part—was obvious. Less so was the other side of Gronk. Because of his persona, you’d rarely hear people positioning Gronkowski as a grinder or a heady player, but that’s exactly what he was. You don’t score 10 touchdowns for Belichick as a rookie if you aren’t both those things. Daboll pulled out Gronkowski’s 22-yard touchdown catch over K.J. Wright in Super Bowl XLIX as an example—a play that looked like a simple fade route but incorporated all the work done in the two weeks leading up to the game, as the Patriots tight end looked for a way to take advantage of the Seattle linebacker playing inside leverage against Gronk. The fight Gronkowski showed down the stretch of that game was part of what made him who he was on the field, which brings us to the play O’Brien pulled out when I asked him, at the Arizona Biltmore lobby bar, if there was one he could remember that best described who Gronkowski was. O’Brien, at this point, put his hands down near his ankles on the barstool, and turned them inside. All of the qualities O’Brien and Daboll are describing, of course, were evident in 2018, and Gronkowski needed to draw on every bit of his reserve to make it work one last time. No longer was he the Gronkowski who posted five seasons of double-digit touchdowns and four of 1,000 receiving yards. He wasn’t the guy who took over in Denver, or the guy going all out to catch a ball off his laces on a high ankle sprain in a Super Bowl practice. But when the chips were down, he was there. Against the Chiefs in the AFC Championship Game, the winning score in overtime came on a two-yard Rex Burkhead touchdown run behind a block by Gronkowski, whose 15-yard reception on third-and-10 got the Patriots into the red zone. And the only touchdown of Super Bowl LIII was a two-yard Sony Michel run, on which No. 87 again helped clear the way. That score was set up, of course, by a 29-yard Gronkowksi catch—the longest play of the game and the final reception of Gronk’s career. In the end it was clear that Gronkowski had given everything. So he most certainly deserves to walk away now, on the top, and his way. RULES CHANGES: HOW FAR WILL THEY GO? The finish of the NFC Championship Game resonated for months, and pretty much everyone hoped the fallout would spark real discussion of meaningful change. Almost exactly two months later, on the ground here at the lush Arizona Biltmore, we’re about to get four days of proof that it has. Once again, rules changes will give the NFL’s annual meeting its above-the-fold (non-Kraft) headlines for the week, and there’s a pretty obvious theme to what will make it to the floor for discussion. Of the 16 proposals for adjustments to the rules, nine involve replay in one way or another. Which, the competition committee isn’t afraid to admit, is largely a result of what happened in the Superdome on Jan. 20. For the record, two of the nine proposals on the ledger would’ve been enough to send the Saints, rather than the Rams, to Atlanta for Super Bowl LIII. Proposal 11, from the Chiefs, would make all personal fouls, called or not called on the field, subject to coaches’ challenge. Proposal 12, from the Panthers, Eagles, Seahawks and, interestingly enough, Rams, would do the same for all player-safety-related fouls. If either of those policies had been in place in January, it’s almost certain that Nickell Robey-Coleman’s helmet-to-helmet hit on on Tommylee Lewis would have resulted in a challenge and a penalty that would have given New Orleans a first down and the chance to run down the clock before kicking a chip-shot game-winning field goal. That probably won’t do much at all to make Sean Payton and his crew feel any better. But it might just move a room full of owners that typically treads lightly on the issue of replay. “[The committee itself] actually made two [of the nine] proposals,” McKay said. “And one of the reasons we did, we want discussion from the membership, to hear from them, where they are on replay, what they like, what they don’t like. We had long discussions. We had support for both proposals on our committee. By the same token, we wanted to hear from the membership on where they are. Remember, this whole idea of expanding replay to penalties and judgment calls was a non-starter very recently in that same room. That it’s not anymore represents a level of progress. This week, we’ll all get to find out just how much progress. Here’s one thing I found interesting about the proposals: There are suggestions on the list that would have overturned the Robey-Coleman play on the one side. But there’s nothing addressing the other side of what went wrong. The Saints could have challenged the helmet-to-helmet no-call. They could not have challenged the pass-interference no-call. And that represents one blind spot in the NFL’s effort to get this right. Neither of the competition committee’s proposals on replay include no-calls, and only two of seven brought by teams do. So while progress is almost certain to come this week, there are still limits as to how far the league is willing to go. We probably won’t get to the point envisioned by Bill Belichick, for one, where everything is reviewable. Now, the flip side—both of the competition committee’s proposals include making a penalty for pass-interference reviewable. So, because there wasn’t a flag on the field, the Robey-Coleman play would not have been reviewable. But had a flag been thrown, Rams coach Sean McVay could have challenged the call. A staggering 25 of those flags—half of them—were for defensive pass interference. That drove the discussion during the competition committee’s meetings, McKay said, and was powerful in telling the group that it was time to take the governor off for judgment calls. On the flip side, the league also identified, via predictive analytics, the 50 most impactful non-calls during 2018. Those, McKay said, were all over the map. “They came across the whole board,” he said. “We have that chart. They’re all about 6 percent, 8 percent.” Which is one reason why the competition committee was comfortable leaving the non-calls alone, and choosing to take expanding replay in smaller steps. Of course, there is an idea floating around out there that could help solve both sides of the Robey-Coleman play, which is where we’ll start our quick hits with McKay. • I’m told the NFL has discussed the Sky Judge system with the AAF, which has implemented it in its inaugural season. So I texted a couple dozen head coaches on Saturday night with a pretty simple question: Would you be in favor of a Sky Judge as an eighth official, stationed in the booth with the broadcast feed? I got 19 responses overnight. Fifteen said yes. Two said no. Two said that they’d need more info on how it would work. Others asked how it would work, and I said the eighth official would basically be a consultant, who could say, “You should throw the flag there.” For his part, McKay said he hasn’t sensed much momentum for the idea, but he did allow that it could come up on the floor. “All you have to do is amend those proposals, if that’s the way you were going to go, although it’s not really replay,” he said. “In the Sky Judge case, as I understand it, it’s a new official. Could it come up? I don’t know. I don’t know that procedurally that’s possible. But the nice thing about us in those rooms, there are good discussions. If somebody brings it up, it’ll be interesting.” It should be noted that there would be work to do to get the mechanics of the Sky Judge in place. • Swept under the rug a little bit was the Broncos’ proposal to create an alternative to the onside kick—giving each team a one-time, fourth-quarter option to take an offensive snap in fourth-and-15 from its own 35, rather than kick off. If the offense converts, it retains possession, as it would in any other such situation. And obviously if it doesn’t, there’s a turnover on downs. I did ask McKay if this is a move towards eliminating the kickoff. He said it isn’t, to his knowledge. “I don’t think those two are related at all,” McKay said. “Kickoff had a good year from a numbers perspective,” he says, noting a significant drop in concussions on kickoffs in 2018. • From what I’m hearing, I wouldn’t give the Chiefs’ overtime proposal—which would mandate each team getting at least one possession—much of a chance of passing. That last point brings me to one final question I had for McKay: Do you worry about being too reactionary to a single event? Personally, I’ve long wanted expansion of replay, but the move to do it now seems like a response to a single event—kind of like the Dez Bryant non-catch of January 2015 pushed the catch-rule changes over the edge. Two months later, we’re finally just a few days from getting a chance to assess how the NFL will deal with the events of January. To me, there’s not enough they can do to make sure they get everything they can right. Patriots owner Robert Kraft will be back in the public eye, and in front of the football media, for the first time since he was charged with two counts of soliciting prostitution, as part of a sting focusing on alleged human trafficking at South Florida massage parlors. Kraft issued a public apology on Saturday, saying, “I’m truly sorry” (without specifying what he’d done wrong). And his lawyer spoke Friday. At this point, I can tell you Kraft is carefully following the guidance of an all-star legal team, which has advised him against speaking publicly. That means you’ll probably see shots of him scurrying into meeting rooms and elevators this week, and little else. I can also say that part of the idea of hiring the team of lawyers he did was to guard against the probability that the state of Florida would make an example of him. The other factor is that a powerful legal team can flood the prosecutor’s office with motions and paperwork, until the prosecutor decides he can’t allot that amount of time on a misdemeanor and drops the charges. But chances are a lot of these charges against the johns will be dropped either way, the real punishment being the humiliation involved. As for the NFL’s place in this, I’m told that Kraft has been doing business with the league as usual, and he retains his role on various committees, so it’s not as if people here haven’t been in contact with him. That said, with Kraft silent, the commissioner and other owners will be left to answer the questions about his case and the possible league-imposed discipline coming. There’s nothing on the agenda concerning labor, but that’s par for the course, and the CBA will likely be a big topic in the special privileged sessions that only owners are a part of. The good news is, I’ve heard (with the acknowledgment that these things are always fragile) Roger Goodell and NFLPA executive director DeMaurice Smith are in a better place than they have been at any point since 2011. As for the broadcast deals, there will be continued discussion on strategy, and how streaming services like Hulu, YouTube, Amazon and Apple will compete with Disney, NBC, ABC and Turner for rights. One change that could come sooner than 2023: Expanding NFL Sunday Ticket beyond DirecTV is on the agenda. Sports gambling is on the docket, again. And this time there’s no cloak-and-dagger feel like there has been in the past. It was right there on the agenda for Sunday afternoon, again for Monday morning in the President’s Session, and then from 1:30 p.m. to 2:30 p.m. in the Monday afternoon Executive Session. No one is hiding from gambling anymore. It’s important enough, in fact, that the NFL has put one of its brightest, chief strategy officer Chris Halpin, in charge, and he’ll be running point on getting everyone up to speed this week. And the one other point I’d get to here, before we actually get into more football stuff, is China. That’s right, China. On the league’s internal timeline for the meeting, it’s the one country that appears on the schedule for international discussion. Part of that could be a move to allow teams to go out on their own, more so than just having the league do it, in selling to what is an enormous market. 1. I have no reason to doubt the Wall Street Journal’s report that Colin Kaepernick settled for less than $10 million, and it would come to confirm what I wrote last month about the agreement between the league and Kaepernick and Reid—this wasn’t a win for either side. It was a draw, as our legal expert Michael McCann has said. The legal liability here for the NFL, based on what’s in the CBA (triple damages in cases of collusion) was well into nine figures. So what this conclusion tells us is that there almost certainly wasn’t a smoking gun on the collusion claim, but there was enough embarrassing info floating around in the ether for the league to want to write a check to make it go away. For an example of the benefit the NFL gets here, look to Tom Brady’s case of a couple years ago. A bunch of his personal email got out. Were the emails incriminating? No. But there was still plenty there that he’d rather not have become public. This deal allows the NFL to avoid that. 2. Last year Arkansas center/guard Frank Ragnow was a late revelation—a name that much of the public hadn’t heard about during February and March, but one that was called in the first round in April. This year’s version? Give me N.C. State center Garrett Bradbury, who is seen among scouts as another low-risk tough guy who could anchor the middle of someone’s offensive line for a decade. One of the strengths of this year’s draft is the number of interior linemen who project as Day 1 starters who should be available on Friday, in the second and third rounds. A month out, I’m not sure Bradbury will be among them. He’s got a real good chance to go the day before. 3. I’m told the Raiders are on the books to conduct private workouts with Ohio State QB Dwayne Haskins and Oklahoma’s Kyler Murray one after the other next week. (Those have to take place either on the player’s campus or near his hometown.) So what should we make of that? Oakland GM Mike Mayock told me this last month on Derek Carr: “Derek is 27, he’ll be 28 in March, and we think he's a franchise quarterback. The other piece of that is a GM and a coach have to look to upgrade the roster at every single position. So do I think there are a whole lot of quarterbacks out there better than Derek? No. But is it my job to always check, and look? Yeah.” So that’s what he’s doing. And there’s also the asset management aspect to consider. The Raiders could just hang on to Carr (who’s on an affordable deal, at $78.05 million non-guaranteed over the next four years), and use the fourth pick on, say, Kentucky’s Josh Allen. Or they could draft Murray or Haskins, having that quarterback at $7 million per (or so) over the next four years, and flip Carr (and his affordable deal) for more picks. So there’s an interesting debate they could have that’s more than just Carr versus Haskins or Carr versus Murray. 4. I had my doubts about Justin Houston, and whether or not he’s breaking down, as he sat unsigned through the first week of free agency. But who it was who signed him has allayed some of those concerns. Why? Some GMs have pretty extensive football knowledge in areas outside of scouting, and Indy’s Chris Ballard has a reputation for being very bright, for a non-doctor, on the medical side of things in assessing players. Combine that with the fact that the two were together for four years in Kansas City, and that Ballard gave Houston a nice deal (two years, $24 million), and it wouldn’t stun me to see Houston have a renaissance season at age 30. 5. If I had to guess now, I’d say, during the last week of April, we’ll be talking about how this year’s draft starts at 3. There’s a pretty decent chance Kyler Murray goes at 1 to Arizona. And if Murray goes to Arizona, I think Nick Bosa to San Francisco at 2 is a slam dunk—Bosa had a late lunch with Niners execs John Lynch and Adam Peters in Columbus on Wednesday. That puts the cards in the Jets’ hands, and the Jets would love to deal out there. Which means they have to be hoping Ohio State’s Dwayne Haskins gets hot, which could happen based on a very solid pro day. 7. Credit to my buddy Alex Marvez of Sirius XM for raising to me what the Rams did last year in player acquisition, and how it relates to this offseason. And it was something I was able to run up the flagpole and confirm: Part of the reason why the team was so aggressive in acquiring receiver Brandin Cooks, and corners Aqib Talib and Marcus Peters was because the brass had a strong feeling that 2018 would be pretty barren at both spots in free agency and the draft. They were right, of course. 8. Don’t be surprised that the Broncos are kicking the tires on quarterbacks over the next month. GM John Elway told reporters here Sunday that the team will host Murray, Haskins, Missouri’s Drew Lock and Duke’s Daniel Jones on pre-draft visits. As we wrote last month, the low draft-pick comp and reasonable, non-guaranteed contract attached to Joe Flacco gives the team plenty of flexibility over the next three years. So they could take a QB at 10 in April. Or they could wait for Tua Tagovailoa, Jake Fromm, Trevor Lawrence or whoever down the road. And that kind of ability to pick and choose the year you take your quarterback of the future, and not be pigeonholed into a single year, is very valuable, as the Broncos learned in 2016. 9. This week can be one for deals and, as such, agent Jimmy Sexton is here in Arizona. And he’s meeting with the Falcons. So maybe something gets done soon on Julio Jones. But based on where things are now, I don’t think it happens over the next couple weeks. 10. It’s worth listening to what Steelers GM Kevin Colbert said Sunday about the draft: “Anytime you’re talking about trading draft picks, I never just use, “it’s a three and a six,” because that six might be Antonio Brown. You say, just throw in a seventh. Well, that seventh might have been Brett Keisel. So you never just want to say, ‘it’s a pick.’ You try to associate a player you could get with those picks. And you go back in history and look at what you got with certain picks, but then you also project who you might be turning away from in a given draft.” This is why I’m pretty sure the Steelers are going to be O.K. in replacing Antonio Brown. They got him with the 195th pick in 2010. Over the last decade, they also got Emmanuel Sanders at 82, Mike Wallace at 84, Martavis Bryant at 118, and Juju Smith-Schuster at 62. The next receiver in the Steelers pipeline, James Washington, was drafted 60th overall last year. And as for replacing Le’veon Bell, the 105th pick in the 2017 draft, James Conner, was pretty good last year. So no, I wouldn’t worry much about the Steelers finding skill players on offense. Fixing the defense, of course, has been another matter. Panthers QB Cam Newton on “Late Night With James Corden.” Um, yeah. A month is a long time. And he didn’t look near tense enough here, on March 20, for this to really be true anyway. Cam’s quote is gonna have legs (and thighs?). Welcome to the biz, Leroy. I don’t care that it’s not football. I’m not gonna come up with a better Video of the Week in 2019 than that one. And if I somehow do … I can’t wait to see it. So there’s one that is football—and other sports too. I have no idea how former Brown/Eagle Emmanuel Acho came up this quickly with this response to the NCAA’s unintentionally hilarious video of last week. But it’s pretty impressive that he did. And that one’s even better. I’ve said previously that I understand the Giants’ logic in dealing Odell Beckham. I also think GM Dave Gettleman—in part, because of his tone and aggressive conversation style (I can relate, being from Massachusetts) – is being treated more than a little unfairly. But that’s doesn’t change that this is pretty good. Redskins CB Josh Norman and Saints LB DeMario Davis for partnering with the United Way to deliver truckloads of water to Flint, Mich., which is still fighting a years-long clean-water crisis. This is the second time the two have worked together on this sort of project—last June they went to San Antonio to hand out backpacks, books and toys to kids separated from their parents at the border—and both projects have helped a lot of young people in dire straits. Kim Martin had the details this week at Yahoo! Sports. 1. I was going to say something on Michigan State coach Tom Izzo here. But I can’t say it better than Scott Van Pelt already did. 2. And one thing I’d add to what Van Pelt already said is that my feeling has always been that some of the best lessons sports teach involve failure. You have a scoreboard, and you learn how to lose. Those lessons serve you for the rest of your life, when things don’t go your way. I know that’s how it worked for me as a kid. And I’d bet Aaron Henry’s had similar experiences. 3. Zion Williamson is ridiculous … but how did that tip in the Duke/UCF game not go in? 4. Best to Ichiro Suzuki in retirement. He’s one of those athletes who opened the door for so many others, and the kind where it’s difficult to articulate his impact to people who didn’t get to see him make it in real time. 5. I didn’t think it’d be easy for LeBron James to win in L.A. I also didn’t think he’d miss the playoffs in his first year as a Laker. If I were an NBA superstar, I’d be leery going there now, given the combination of his contract and the chance that he really starts to lose a step soon. 6. Is it me, or is there no buzz around baseball’s opening day? As we said earlier, there’s strong sentiment among coaches that adding oversight to officiating crews—whether it’s via a Sky Judge or some other mechanism—is needed. I’ve been told that was voiced on Sunday here at the owners’ meetings. And I can tell you I heard it when I asked around, doing my informal poll on Saturday. “Anything to help the officials, I’m for,” said an NFC coach. Another NFC coach echoed that, saying he thinks the Sky Judge role could help extend the careers of good veteran officials who bring a lot to the game. We’ll see if what these coaches think sparks any movement this week. I’d say, knowing how these things work, it’s probably more likely it just lays the groundwork for 2020. But you never know.